This revolutionary technology can literally save your life! With VELscope®, abnormal tissues can be found in the mouth. Thanks to a simple, fast and pain-free examination, we can detect lesions and cancer growths earlier. VELscope® detects mouth cancer in only a few minutes! 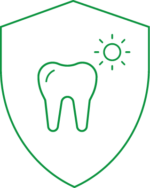 Many factors can lead to tooth and gum problems, like smoking, drinking alcohol or poor heating habits. Did you know that they are among the most common causes of mouth cancer? Do not wait until it is too late to see your dentist. A preventive examination is fast and pain-free. Contact us today for an appointment.